Harvard Medical School is accredited by the Accreditation Council for Continuing Medical Education (ACCME) to provide continuing medical education for physicians. 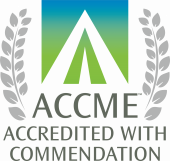 Harvard Medical School was awarded ACCME's highest level of accreditation, Accreditation with Commendation. Harvard Medical School Continuing Medical Education (CME) offers an extensive, best-in-class catalog of continuing education activities that serve the diverse educational needs of healthcare providers. Our offerings promote quality improvement in clinical practice and health care, medical research, and lifelong learning. HMS CME spans a wide domain of topic areas across all medical specialties and subspecialties within the basic medical sciences, clinical medicine, and the provision of health care to patients. New knowledge gained prepares healthcare providers to implement system and practice enhancements in the delivery of health care to patients. Over 200 courses designed and led by leading experts and master clinicians to advance your practice of medicine and optimize your patient outcomes. The Course Activity Planning Site (CAPS) is a dedicated resource tool for course directors and course administrators who are planning a new or renewing an existing educational activity. The purpose of our CME program is to serve the educational needs of our learners by developing innovative continuing education activities based on best practices or evidence-based medicine.